The search for a missing Williamsburg man over the weekend may have turned up a lead for investigators in another missing person case. Williamsburg Police Lt. Detective Wayne Bird said Paul Gregory Monhollen's aunt had reported him missing on June 6 after not hearing from him for two or three days. Bird said this was unusual because the aunt had control over Monhollen's finances because of a mental disorder that causes him to be a paranoid schizophrenic. When authorities went to Monhollen's home, which is near the Cumberland River off Second Street, they discovered the doors open but nothing missing. Bird said Monhollen hadn't been taking his medication, and authorities feared that he might have jumped into the river because of his mental condition. About two dozen searchers from the Williamsburg-Whitley County and McCreary County rescue squads started about 7 a.m. Saturday combing the banks along the Cumberland River near the floodwall on the ground for about one mile area. In addition, three rescue boats of which two had search dogs, also searched a seven-mile stretch of the river. The search yielded no signs of Monhollen. Authorities learned about 12:45 p.m. Saturday that he was at a homeless shelter in Lexington and had contacted a family member requesting that they wire him some money, Bird said. Bird said the search effort may not have been entirely for naught. He said search dogs indicated the possible presence of human remains in the river about 2,700 feet down stream from where another dog had indicated in May. Bird said the May effort was a search for Danny Ray Harrison, who has been missing since 2000 and is presumed dead. "The dogs are really showing interest in that area," Bird noted. Two dive teams, one from Morehead and the other from Bowling Green, are being brought in this Saturday to search the river, which is about nine to 10 feet deep in that area, Bird said. The dive crews will also have underwater cameras to aid in the search. The water search effort for this Saturday is being orchestrated by Jerry L. Rains, Kentucky Division of Emergency Management Area 11 Manager. On Nov. 18, 2000, Harrison's uncle dropped him off at a local homeless shelter. Then Harrison walked away from there towards the Riverside Motel about 5 p.m., and after that nothing. "The last place he was seen was walking north on US25W near G&E Drive-in," Bird said. "He had checked into Williamsburg Christian Ministries on two or three different occasions. Of all the times he stayed there, he normally didn't stay any longer than a night or so." It was very usual for Harrison to go more than two or three days without calling his family and checking on his daughter, Bird said. In March 2005, Williamsburg police and local emergency services agencies conducted a two-day search along the river looking for Harrison's remains. An anonymous tip from a caller in Michigan reported that a young man from the Williamsburg area had bragged about killing a homeless man near the railroad tracks. 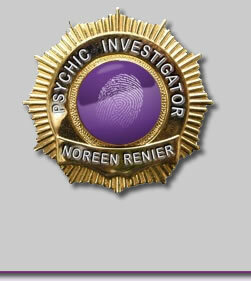 Bird said the tip coincided with information police obtained from a world-renowned criminal psychic, Noreen Renier, who he contacted in early 2005. According to her web site, Renier has worked on over 400 unsolved cases in 38 states and six foreign countries. At the time the psychic was contacted, the investigation was at a standstill with no leads. Harrison, who was 47 when he disappeared, was originally from Tennessee, but had moved to Williamsburg a few months before he disappeared. Harrison is a white male, who is 5'7" tall and weighs 185 pounds. He has gray hair, blue eyes, and a medium complexion. He was last scene wearing bib overalls, a white T-shirt, and white tennis shoes. Anyone having information about the case can call the Williamsburg Police Department at 549-6038, and ask for Bird. Rains, Whitley County Emergency Management Director Danny Moses, Lesha Powell, her search dog and Commonwealth K-9 Search and Recovery assisted with the search Saturday. 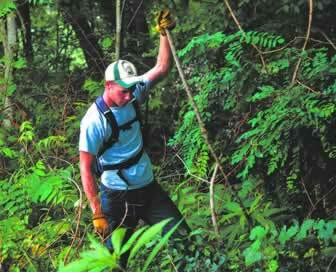 A rescue worker helps search for a missing man Saturday.